Friday July 25th 2014 saw Liz and I heading out to a couple of the club’s more distant waters. There are two pools … well, more ponds really as they have only about 8-10 swims each and when the club holds matches there they utilise both pools. Both are easily castable along the longest dimension from one bank to the other. 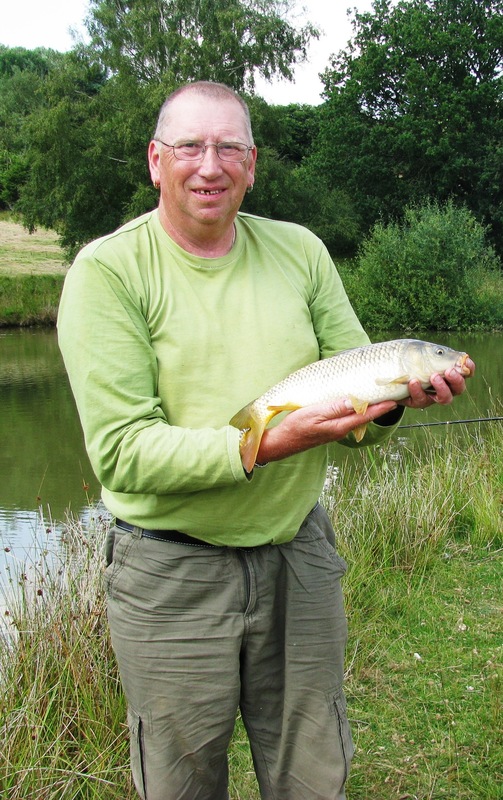 But both do hold a good head of quality fish of many species – and the pool we chose to fish has good grass carp in there and with the hot, bright weather they are usually cruising and taking floating cereal baits. The best I’ve had was just a tad over 7lb taken in September 2013 but they do go into double figures easily. Anyway, with the hot bright weather it seemed that the grass carp would be the best species for the conditions. So, Liz and myself tackled up on the banks and started fishing at around 0845. As there were no signs at that time of the GC being active, I tackled up two rods with 8lb line on a straight leger set up… one with a size 12 hook baited with maggot and worm, the other with a size 6 baited with chilli sausage. My swim faced a small island and so I baited along the edge of its facing bank with maggot and to the right hand end with chilli sausage. Liz fished with feeders – and used maggot and meat/sausage baits – fishing in an area that accessed a bay with overhanging bushes on the far corner to the left, open water in front and the left end of the island to her right. 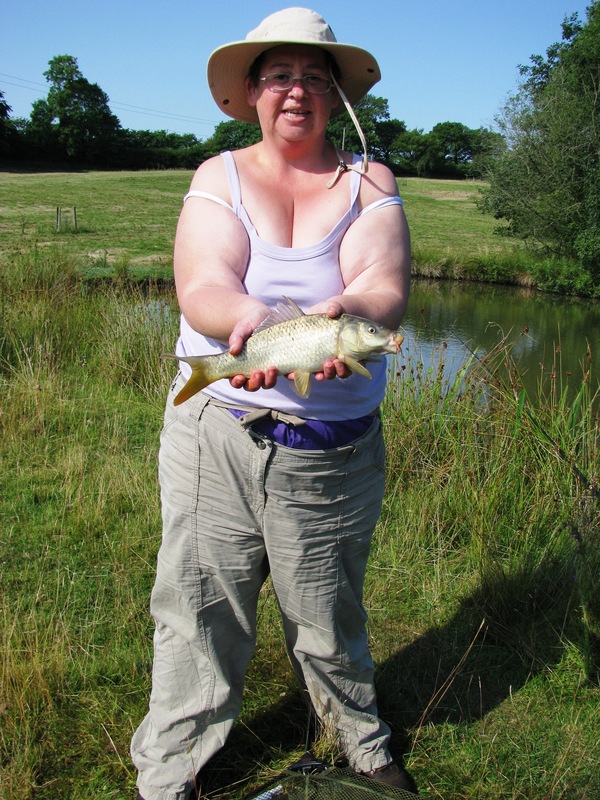 We both had bites almost from the start and Liz took first blood with a common carp of around 1.25lb… and over the course of the day I added another 4 common carp of around the same size… and a mirror carp of around 2.5lb. And we both had plenty of small roach on maggot – and worm – of around 1-2oz. So, the grass carp never materialised… as, although they did eventually start feeding, they did so in the most inaccessible place in the entire pool. Over the day I’d been catapulting, from time to time, bits of Yorkshire Pud and a few dog biscuits upwind (generally to my right) to drift down the pool as attractants and, as I say, there started to be activity BUT right on the bank of the island that faced the wind – and ‘right on’ literally meant within 12” of the bank itself. This would have been OK had it not been that that bank had an overhanging tree with branches drooping to within a couple of feet of the water AND protruding 20 feet or more out from the bank which meant a direct cast was unable to be made anywhere near them. I did try, however, walking to the windward end of the pool and casting floating baits over to the far bank and then walking with slack line to my station – the intent being for the wind to catch the bait and bow in the line and thus pull the bait under the branches and to the island’s bank. However, to get the bait to the right spot proved virtually impossible – all went well until the bait actually entered the area beneath the branches but then the sheltering from the breeze afforded meant that the bait was no longer getting pushed in towards the island and the pull on the line twixt island and myself meant that the bait was being pulled over towards me and away from the line of the island… and all attempts to mend the line, etc were really in vain. On the best attempt I did manage to get a bait almost on the right line and about 3’-4’ shy of the bank when I there was a big swirl and the line shot off and I struck into something solid causing a miss of heartbeat… but a few seconds later I realised it wasn’t a grassy and turned out to be the mirror carp. So, a bit of a disappointing but still thoroughly enjoyable day’s fishing. Stonkingly hot too! BUT … the pool is down a slope in a sheep field – which meant that when we packed in at 1630 there was a big task ahead – to pull the ‘barrow loaded with two loads of tackle, baits and leftover personal nourishments up this 200 yards of hill made up of 6” grass, covering bumps and humps and collapsed mini-ditches – and all this in full sun with a temp of 26+C… I managed to get around the flat section around the pool (we were on far bank viewed from the car) and about a third of the way up the hill before I admitted defeat and unloaded a part load to make the pulling manageable, got the barrow to the car, and left Liz to start filling the boot whilst I returned back down the hill for the dumped items. SO… a decision has been made… less bait!!! I also took my 60” brolly shelter yesterday which adds at least another 60% to the weight of my rod quiver and the standard 5 rods I carry for pool fishing (2 leger rods, 1 floating bait rod, 1 float rod and a quiver tip rod) but was never used – and was never likely to be used… although I did consider using it for shade but at the time it was far to hot to mess about doing that… should have taken my standard 45” brolly at less than half the weight of the ‘monster’, if I took one at all. Next week … Tuesday back to the Shrops-Union Canal for another early morning session. Friday, not sure, if so will be on my own. Expecting guests in a couple of weeks time and need to get the house ship-shape so Liz, as she works, def. booked next Friday for housework – me, I’ll try to get caught up on my jobs in the week but there’s always something that crops up… so touch and go really.